I have some pretty bad eczema that flares up during times of stress. It’s been a problem on and off for the past year. If didn’t know it was eczema at first. Actually, I thought based on my symptoms that I might have an auto-immune disease. I had coin shaped red patches that flared up on my legs, arms and hands. I struggled and struggled for a long time to find a remedy that would help it and found nothing. That’s when I broke down and finally went to the dermatologist. They identified it as “numular eczema” and gave me a prescription for a low-level steroid cream to use when it flares up. I used it initially to get a handle on it as it was getting out of control and the spots were spreading to new places. Since then I’ve tried to only use it during particularly bad flare ups but I’ve still been at a loss to find a remedy that actually helps it besides the steroid cream the doctor gave me. Most natural remedies I’ve tried have actually inflamed it and made it worse. Particularly oils. Any type of oil or oil based remedy makes it worse and not better. This is particularly true of essential oils but also of very basic oils like olive oil, almond oil, coconut oil, etc. In the past year I’ve tried pretty much everything you can think of to help improve this eczema from topical remedies to diet changes to traditional medicine. My particular form of eczema is stressed based. I admit – it’s been a stressful year. So, my eczema comes and goes and waves but since this ailment began it has never completely disappeared. It’s gotten better for periods of time and then worse again. I eliminated various foods (sugar, caffeine, etc.) to see if that made a difference. It didn’t. In fact, the doctor told me that this particular form is not related to diet like many forms of eczema is, but instead is the body’s direct response to stress. While it was relieving that my condition was only eczema, it was not particularly encouraging that it was related to stress since I can’t exactly eliminate that from my life. Life is life right? It’s stressful sometimes and you can’t always remove those stressors. I also suspect that my flare ups are related to hormone fluctuations. Also I thing that I can minimally control. So, I kept trying things and I think I’ve finally landed on a couple of things that are causing my eczema to actually heal and improve. As I started researching further I looked specifically for herbs that have steroid-like actions and properties. I found three. Then I started experimenting with a medium that I could use to apply these herbs that wouldn’t aggravate my eczema. I found two. Here are my solutions that seem to be helping my eczema. 1. Powdered Herbal Paste: yarrow flower powder, lavender flower powder, turmeric powder, bentonite clay. Yarrow is a very powerful healing herb. Lavender has anti-histamine and healing properties. Turmeric has strong anti-inflammatory properties. Bentonite clay is cleansing and toning to the skin. Mix all the powdered herbs and the clay. Store the combined powder in a glass jar. When ready to apply, remove a small amount of powder and mix with a small amount of water in a glass container to make a medium textured paste (not watery, but not like mud). Apply with a popcsicle stick to affected areas of eczema and leave until it dries. Gently remove with a washcloth and warm water. If this paste feels too drying to your skin, remove the bentonite clay and make a paste with just the powdered herbs. This paste can calm a flare up that is dry and scaly. Note: Turmeric stains clothing yellow so avoid getting the paste on your clothes. 2. Natural “Hydrocortizone” Cream: I know, I know…. Combining the words “hydrocortizone” and “natural” in the same sentence is an oxymoron right? Well, here we will combine the three herbs that have naturally occurring “steroid-like” properties with the two mediums that did not aggravate my eczema – tallow and lanolin. Tallow is the rendered fat of beef. It is a fat that is solid at room temperature and has historically been used for skin ailments. 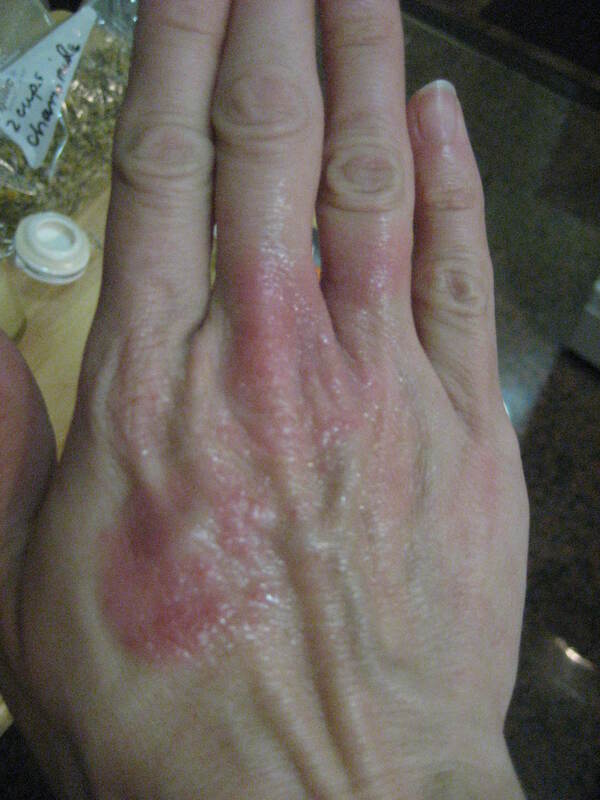 I had heard and read that it was good for eczema but had never had an occasion to try it. Well, I finally was able to get my hands on some grass-fed soup bones and I made some. I was pleased to see that it did not aggravate my eczema like all the other oils and fats did. However, alone it did not particularly improve it either. I also found that lanolin was not aggravating. I saw some improvement from applying lanolin overnight on the worst spots and putting a cotton glove on my hand so that the lanolin didn’t rub off while I slept. I was always better in the morning but then would flare up during the day from washing my hands, heat from cooking ,washing dishes, etc. So, for this remedy a combination of lanolin and tallow will be the medium in which we are going to infuse the steroid-like herbs. Those are chamomile, licorice root and calendula flowers. To make this cream, put your lanolin, tallow, chamomile, calendula and licorice root in a jar and loosely cover with the lid. 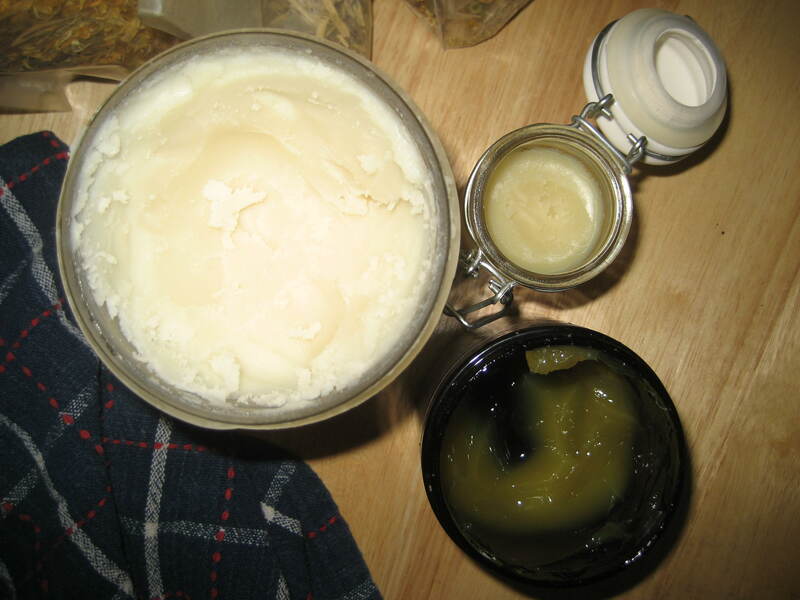 Use 1 part lanolin to 3 parts tallow. For the herbs use a 1:2 ration of dried herbs to fat/lanolin. Set the jar in a sauce pan on top of a washcloth and fill with about 2-3 inches of water. Simmer until the tallow and lanolin have melted. Swirl the herbs around in the jar to cover them all. The herbs should be fully immersed in the tallow/lanolin mixture. If they aren’t add some more tallow and lanolin. When everything is melted, simmer for about 5 minutes more. Turn off the heat. 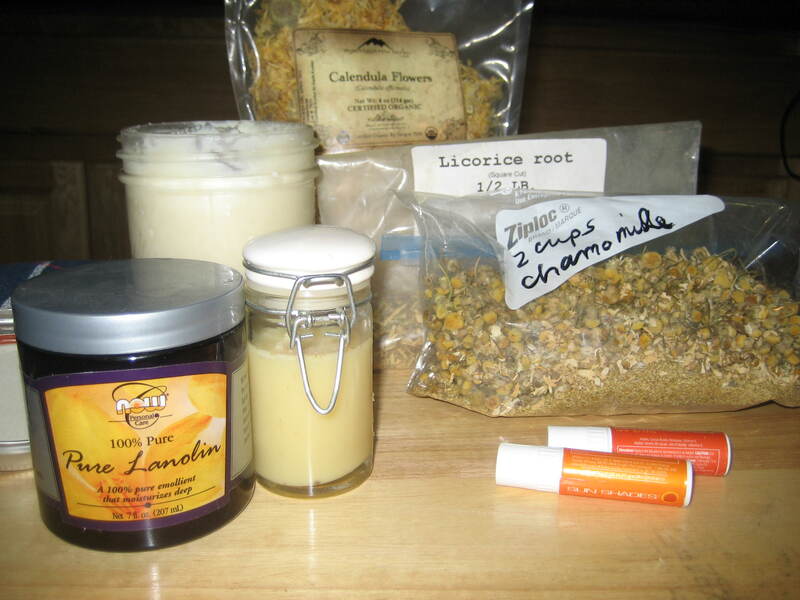 You how have infused the herbal properties of the chamomile, calendula and licorice root into the tallow and lanolin. 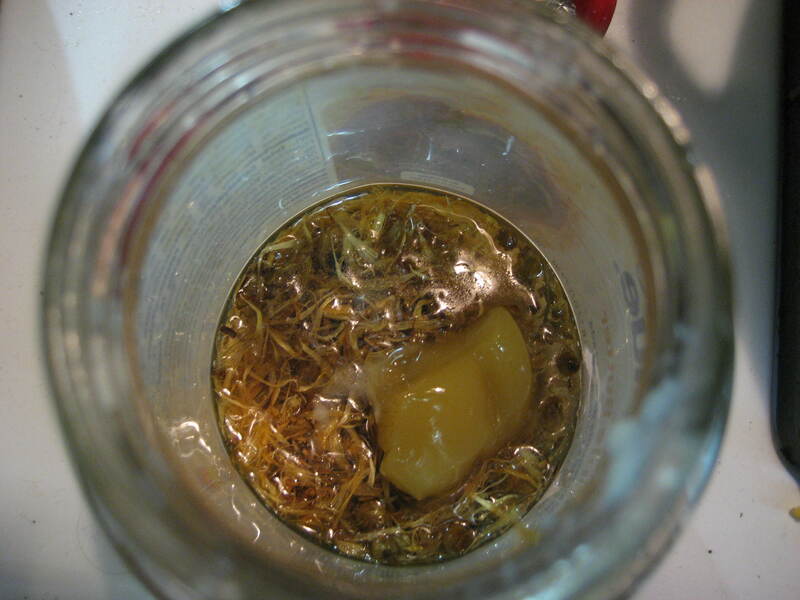 Strain immediately while hot through a wire mesh strainer into a glass storage container. For convenience, I also poured some into some old, empty lip balm tubes so that I can easily take this with me when we are out. I find that environmental factors make my flare ups worse. We took the subway the other day and something down there made the eczema on my hand flare up from being almost completely clear to a red, itchy mess. So I plan to apply this all day even when we aren’t at home. Allergy Note: If you have allergies to ragweed, dandelion, sunflower or safflower you may want to omit chamomile as it is in the same family. I hope these remedies help your eczema stay clear. It’s making mine better already. Disclaimer: This is not medical advice. Use at your own risk. Author takes no responsibility for the results of using these remedies. Read full Disclaimer here. This entry was posted in Body, Health, Medicine Cabinet, Remedies. Bookmark the permalink.